State Forest Commissioner Joseph Rothrock at Eagles Rock, PA, circa 1900. 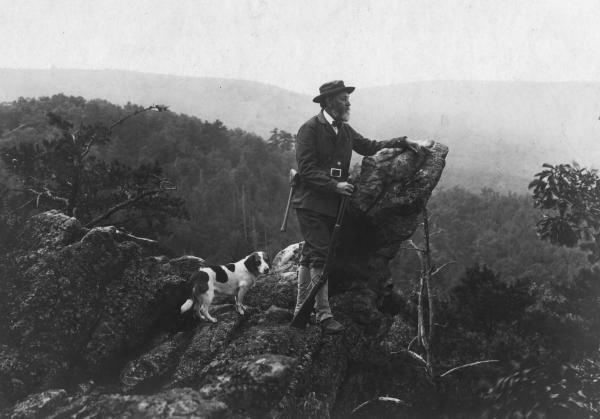 The father of the forest conservation movement in Pennsylvania, Joseph Rothrock began the campaign to protect the Commonwealth's endangered woodlands in the late 1870s. Appointed the state's first Commissioner of Forestry in 1895, Rothrock shaped and supervised Pennsylvania's forestry programs for a decade. When he retired in 1904, the Commonwealth had acquired more than 443,000 acres of forest.